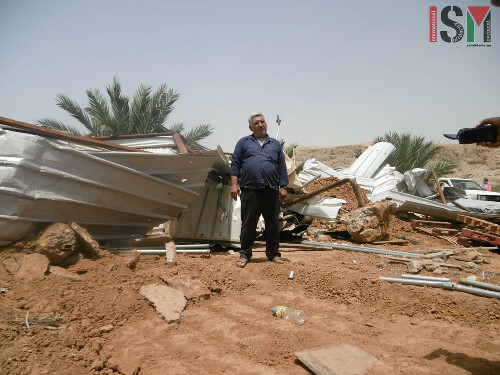 Yesterday morning (27th of April 2015) at 5 am in the area of al Makhrouk, al Jiftlik, the Israeli military arrived with bulldozers and demolished four houses belonging to Fathe Abdullah Ahmad, Tareeq, Yakub, Mohammed and Mahmoud Lahafe Dadoub. The houses were located right next to the agricultural settlements of Masu’a and Argaman. 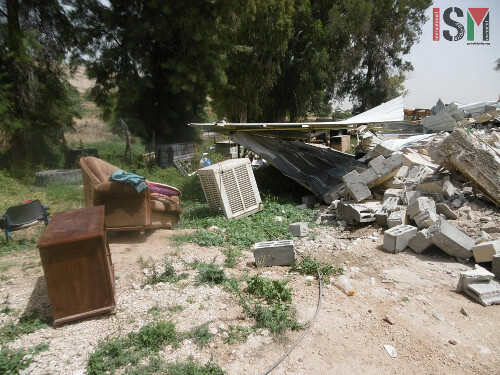 The first house to be demolished was owned by the Tareeq family, where Mohammed Abu Amer lived with his family of five. This was the second time in less than a year that their home was destroyed, despite not receiving a demolition order. As farmers of dates and vegetables they lived next to the land they were working on. Three of the family members are children aged 1, 5 and 3 years old. Fathe Abdullah Ahmad Tareeq in front of Mohammed Abu Amers family’s demolished home. Their first house was demolished on the 10th of March this year. This house was built in August 2014, and received a demolition order straight away. After losing that house of 114 square meters containing bedrooms, 2 bathrooms, kitchen, balcony and a barn built at the cost of 35 000 shekels (9000 US dollars) the family rebuilt the house. The second house was 50 square meters, consisting of a kitchen, a bathroom and a bedroom and cost 8000 shekels (2000 US dollars) to build. 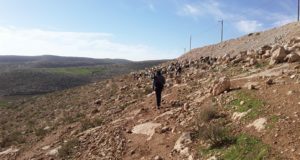 When activists from Jordan Valley Solidarity and the International Solidarity Movement arrived at the site the family was already building a tent for shelter. They explained that just ten minutes before the army was there taking photos of them working. Ever since they rebuilt the house last month the family has been under heavy surveillance by the Israeli military, which has been looking for evidence of building work at least five times. The military came again last night, just hours before the demolition. The father of the Tareeq family, Fathe Abdullah Ahmad Tareeq, has a house in the village of Jiflik. This was also demolished. Instead of the previous breeze block structure, this time it was rebuilt in tin. At 5.40 this morning the army bulldozed the neighbouring houses of Yakub and Mohammed Lahafe Dadoub. Each of their houses had two rooms, a kitchen and a bathroom. The older parts of the house, (consisting of bathrooms and kitchens), was built of breeze blocks two years ago. When the families started building the other rooms out of tin 9 months ago the army came, took photographs of the houses and left a demolition order under some rocks outside their home. This was the only communication the family had received concerning the demolition. The family does not have a lawyer to represent them in the Israeli court. Their previous experience is that the Israeli court system systemically and deliberately discriminates against Palestinians. Wreckage of the family homes of Yakub and Mohammed Lahafe Dadoub. Yakub and his wife lived in their house together with their 1 month old and 2 year old daughters. Mohammed and his wife have five daughters between the age of 1.5 and 8. The houses were built for 50 000 shekels each (13000 US dollars) and it will cost more than that to rebuild. The family are determined to clear away the rubble from their demolished home and rebuild on the same spot again. In a neighbouring house their brother Mahmoud Lahafe Dadoub lived with his family of 10, including 4 children. They built their house there to live closer to the family’s farm land in the Jordan Valley. The construction of the house cost of 30000 shekel (7500 US dollars). 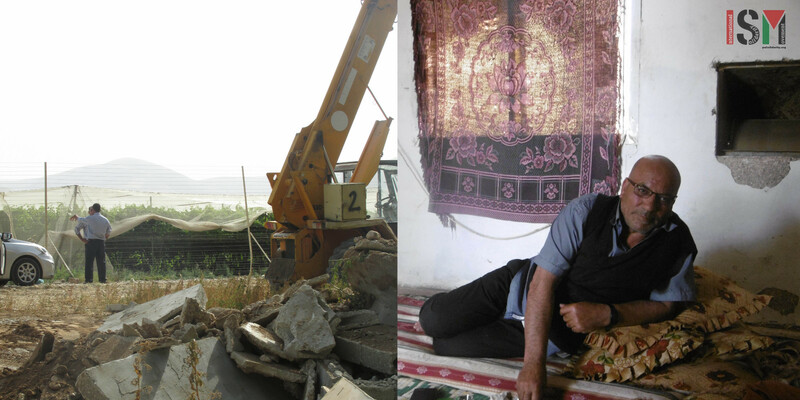 Today, after receiving a total of three demolition orders, their house was demolished for the second time. The family will rebuild the house on another part of their land, which will cost them the same amount again. 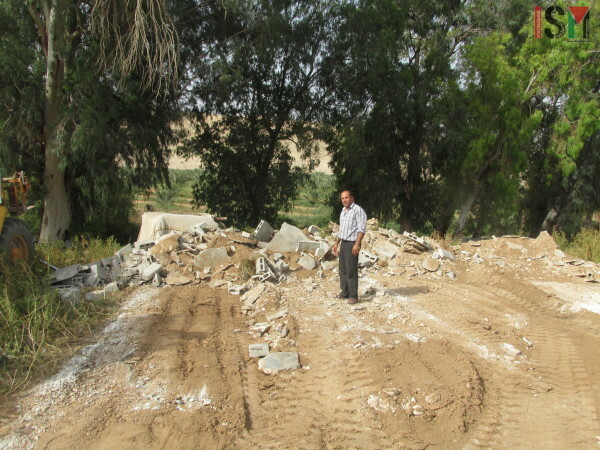 Mahmod Lahafe Dadoub on the spot where his family’s home was. 93.4% of the Jordan Valley is in ‘area C’ (full Israeli control), with 37 illegal Israeli settlements, most of which are agricultural. The expansion of these settlements and the theft of Palestinian land and demolition of Palestinian homes are part of Israel’s policy of ethnic cleansing and colonisation of the most fertile and profitable areas of the West Bank. 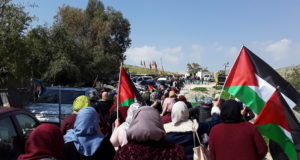 Whilst Palestinians are violently forced out of their homes and forbidden by law to build the smallest farmhouse, Israelis are encouraged to build both homes and businesses in area C.
Most Palestinian houses in the area have pending demolition orders. Meteyb Lahafe Dadoub, the father of the three brothers has 15 children, and in 2012 his son Ayman’s home was demolished three times (see article). The neighbouring houses of Mahmoud, and Mohammed and Yakub, (another son of Meteyb), also have demolition orders, in place since 2006. (Left) The settlement of Masu’a’s fences right next to the brothers demolished houses. (Right) Meteyb Lahafe Dadoub’s family have faced repeated harassment from the Israeli army. The family had previously owned a successful agricultural export business, which specialised in exporting olive trees to the United States, Jordan and Gaza. Their business was ruined by Israeli restrictions that prohibited the export of their products. 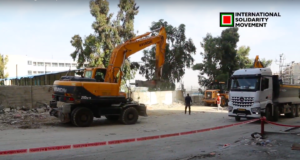 When interviewed, Meteyb explained that the Israeli court usually does not care about the demolitions; even on the rare occasions when Israeli courts demand that a demolition order should not be carried out the army will sometimes still choose to continue with the demolition.